Invented by Dr David Sinclair. Copyright (c) 2010 Dr David Sinclair. S-hull.org now offers GPL version of the C++ code for s-hull-pro and s-hull-pro-INTEGER as well as s-hull-3D (christened the Newton Apple Wrapper algorithm for 3D convex hulls AND Delaunay triangulations). If you need a non GPL version please look at commercial licensing. If you like the code and would like to make a donation of 4.00 pounds Sterling that I WILL spend on beer then please use the buy it now button:). This also gives you a non GPL licnse to the C++ s-hull-pro and s-hull-pro-integer and s-hull-3D (NA_wrapper)code! 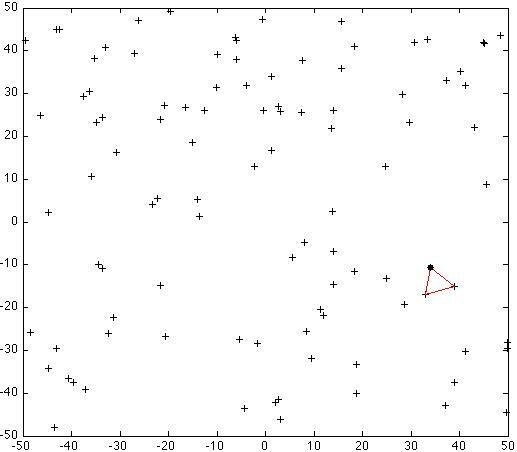 A new O(nlog(n)) algorithm is presented for performing Delaunay triangulation of sets of 2D points. The novel component of the algorithm is a radially propagating sweep-hull (sequentially created from the radially sorted set of 2D points), paired with a final triangle flipping step to give the Delaunay triangluation. In empirical tests the algorithm runs in approximately half the time of q-hull for 2D Delaunay triangulation on randomly generated point sets. 1: sellect a seed point x_0 from x_i. 2: sort according to |x_i - x_0|^2. 3: find the point x_j closest to x_0. 4: find the point x_k that creates the smallest circum-circle with x_0 and x_j and record the center of the circum-circle C.
5: order point x_0, x_j, x_k to give a right handed system thi is the initial seed convex hull. 6: resort the remaining points according to x_i - C|^2 to give points s_i. 7: sequentially add the points s_i to the porpagating 2D convex hull that is seeded with the triangle formed from x_0, x_j, x_k . as a new point is added the facets of the 2D-hull that are visible to it form new triangles. 8: a non-overlapping triangulation of the set of points is created. (This is an extremely fast method for creating an non-overlapping triangualtion of a 2D point set). 9: adjacent pairs of triangles of this triangulation must be 'flipped' to create a Delaunay triangulation from the initial non-overlapping triangulation. 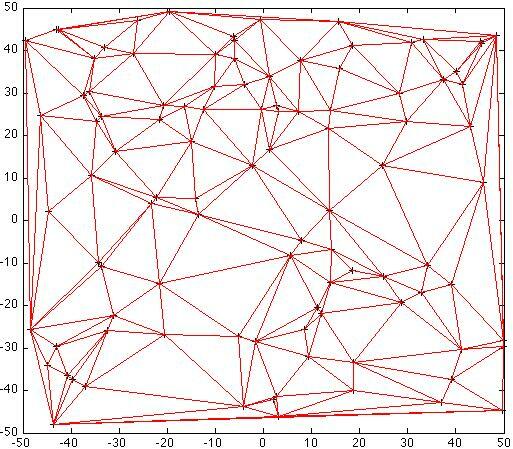 The algorithm generates a Delaunay triangulation together with the 2D convex hull for set of points. 1: a randomly generated set of 100 points in R2 with the initial triangular seed hull marked in red and the starting seed point in black. 2: propagation of the sweep-hull, new triangles in red, existing triangles in blue. 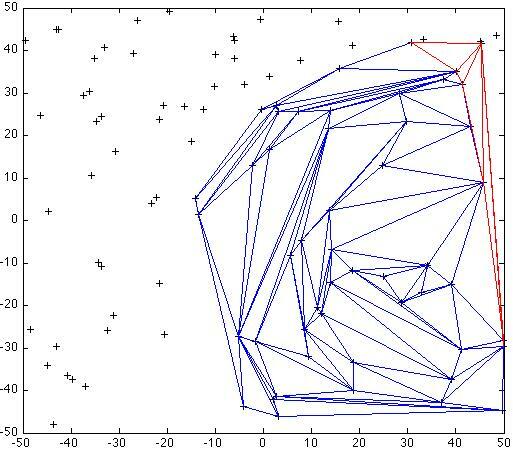 3: the delaunay triangulation generated by s-hull. Table 1 gives empirical times for s-hull and q-hull for point sets that range in size form 100 to 1,000,000. S-hull is empirically faster. The test code was compiled and run on a MacBook Pro using gcc i686-apple-darwin9-g++-4.0.1 . S-hull exists to further the art of Delaunay triangulation and associated distance transform based techniques. The code on s-hull.org is released under a contributor's beerware license (details in the Ts&Cs). An implementations of s-hull have been contributed by Phil Atkin in C# and a Python binding by Christian Delfosse. If you think s-hull if worth it and you meet Phil Atkin or Dr Sinclair or Chritian Delfosse in a pub or bar you could by them a beer, alternatively you could email david@s-hull.org and arrange to make a donation of 10 of your local currancy units to support s-hull.org.